With the same passion that we are used to see them on TV, and with the same powerful words and inspirational presentations they grabbed the audience’s attention at BarCamp Prishtina #23. 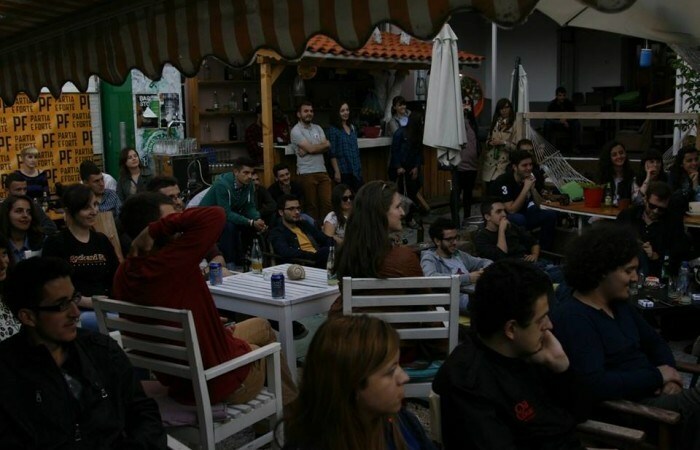 Journalists and journalism was the main theme of the last edition of BarCamp Prishtina for the summer 2014. Milot Hasimja and Besa Luci shared their interesting stories which made all BarCampers laugh and think at the same time. After a long period of editions held indoor, this edition of BarCamp took place in White Tree Hostel, an ambient which gathered more than 60 participants from different backgrounds. For most of the people in the audience the story of a fireman who became a journalist was unknown. Although we are used to see him almost on daily bases with his interesting stories on Klan Kosova TV, we never knew that Milot Hasimja was a fireman who has witnessed many stories under the ‘against fire’ uniform. “I first started as a translator for the armies stationed in Kosovo, and then I continued my work as a fireman. I have seen many things during the two years and for a blink of a second I decided to make a switch. I remember that after meeting with a friend of mine I decided to try journalism”, he said. But this switch was not the easiest one that Milot has experienced. “It was really hard to go from a 750EUR salary to a 200EUR. Your life style changes, and you change. However, it was the passion that kept me loving every second of my life as a journalist”, Milot explained. He was part of the founding team of Gazeta Express and for 5 years now he works as TV journalist at KLAN Kosova bringing different stories from cities and villages of Kosovo and internationally. Living in Kosovo and studying abroad for a long period of time has enabled her to see the world from a different perspective. “Seeing all the media in Kosovo and their way of presenting I thought that we might bring something new and different to Kosovo’s readers. That’s why we established the Kosovo 2.0 magazine”, she explained. Besa launched the magazine with the core aim to provide readers with stories and articles which cannot be found elsewhere. The Kosovo 2.0 was first initiated by a group of people, but it is now running by many other who are not placed in the office. “We are only a small team that works on daily basis . However most of the contribution on the magazine is gained by freelance and volunteer journalists”, she said adding that in today’s world, journalism is generated by publik ideas and discussions on social media. Up until now Kosovo 2.0 has reached 300 bloggers, 350 contributors and 60 interns.